SAL DeTRAGLIA'S VIRTUAL TAPAS BAR: HAPPINESS IS A NERDY HAT. I first saw a Mad Bomber Hat in a Champaign, Illinois hiking store in 1994. My friend—the infamous “Tony Lee”—and I were buying supplies for a post-Law School trip to Alaska. Hidden in the back corner of the store was a rack of Mad Bomber Hats. We stopped dead in our tracks. The hats were mesmerizing. The outer shell was of nylon or—for an additional $15—leather. The inside and front brim were lined with rabbit fur. Have you ever seen a rabbit with frost-bitten ears? Neither have I. And now, I know why. Tony and I each grabbed a hat and tried it on. Although we didn’t discuss it, I’m fairly certain that we both felt a tingling in our loins—the likes of which we hadn’t experienced since that Porky’s movie came out when we were in junior high school. We stood looking at the mirror—our skulls joyously enveloped in soft, fluffy rabbit fur—and agreed on two things. First, these were the greatest hats ever crafted by human hands. And second, there was no way we would buy them…because we looked like complete nerds. Tony’s then-girlfriend (now wife), Aiko, readily agreed. We thus proceeded to Alaska clad in wool and fleece; not fur. Eleven years later (i.e., last week), I found myself in a ski shop in Avoriaz, France on a cold, snowy morning. And what did I see hanging on a rack next to the entrance? Mad Bomber Hats! Now, let me say that there are a few good things about getting older. Teenagers avoid you like the plague. Coffee starts to taste good—or at least, kind of good. Shoes seem to last forever. But I think the best thing about aging is the loss of one’s vanity. Take me, for example. My hair—which, in the days of my youth, I would fuss over for twenty minutes each morning—hasn’t been touched by mousse or a blow dryer since Bill Clinton was president. Most days, I don’t even comb it. 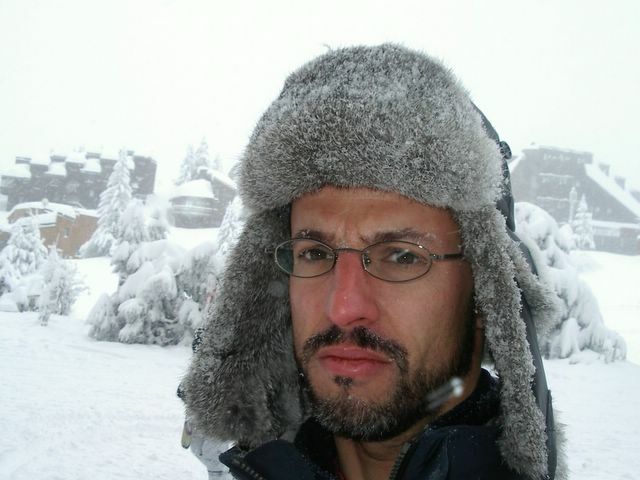 I was therefore pleased to discover that—eleven years on—I no longer cared if the Mad Bomber Hat made me look like a dork. I had to have one. So, I bought it without hesitation. 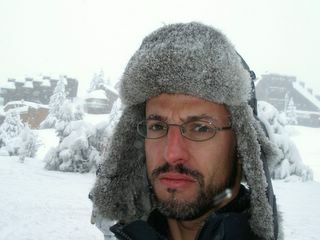 And it’s fortunate that I did, because the weather in Avoriaz turned brutal the next morning. Temperatures plunged to -20ºC; with ripping winds. Which got me thinking about an interesting article that I read in the Chicago Tribune last winter. The journalist interviewed several Russian immigrants on the topic of Mad Bomber Hats; which, as we all know, are commonly worn in Russia. One of the main questions was, “At which temperature should the hat’s ear flaps be lowered?” In a stunning display of machismo (or machismo-inspired lying), nearly all the Russian men insisted that the flaps should be lowered only when the mercury hits -10ºF. Huh? -10ºF?! That’s -23ºC! At the risk of being labeled a “sissy” by the Russian community, I intend to lower the flaps on my hat as soon as the first tree starts losing its leaves in autumn. Nerdiness does not exist at -20ºC! What?! Leave the law to write a book?!!! Hmmmm...actually, that's sounds like a pretty good idea. OK! I'll do it. Next Monday! How's this for a book idea: Anders and Sal sit in a Starbucks in Copenhagen and devise a plan to steal the Little Mermaid in order to extort a ransom from the government. I'll call the book, "Coffee and a Danish." Now, all I need is a publisher and/or literary agent. And, of course, a better idea for a book. Hasta pronto, my Dansk amigo. The cheeseburger is gone. Don´t know yet how to include text with my pictures. Too old for new techniques. Pity because my text was a masterpiece. Sal, you certainly look a lot better in yours than I did in mine.